The survey conducted by Perkins Coie on AR, VR and MR technologies shows positive outlook on the future of large-scale adoption. According to the third survey conducted by Perkins Coie law firm and XR Association, by 2025, XR technology will be as present as mobile phones today. The leading industries that will see the biggest rate of application are gaming, healthcare and education. Apart from the positive outlook, the survey also reveals that there are still barriers to mass adoption that must be overcome. The survey consisted of 200 respondents, including executives of established tech companies (67%), founders or executives of XR technology startups (18%), advisers or outside consultants (7%), policymakers or government representatives (4%), as well as investors (4%). Immersive technology will be as ubiquitous as mobile devices by the year 2025. Unsurprisingly, the respondents believe that gaming, healthcare and education are the industries where XR technology is currently most applicable. However, there are other industry sectors that the survey identifies as having a good potential for XR adoption. enabling collaboration between team members in different geographical areas. The Perkins Coie survey indicates three large areas of concern for the stakeholders: consumer-related, investor-related, as well as legal risks. 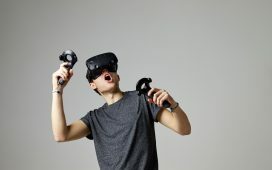 As far as the consumer and market-related challenges go, the respondents identified user experience (such as bulky hardware and technical problems) as the biggest obstacle for both AR and VR adoption. The second most important obstacle is the quality and quantity of available content. The third is the fact that both consumers and businesses are still hesitant to embrace the XR technology. On the other hand, the number one concern of investors is the slow adoption (69%). Lack of an established market (58%), untested technology (34%), as well as too much competition from startups that develop similar products (22%) also present concerns. Nonetheless, the most significant concerns are those connected with legal risks. As expected, respondents identify data protection, liability and intellectual property concerns as the most significant risks. training employees on cyber security risks (26%). And of course, the survey also tackled the question of which market will develop more and faster. Most respondents (70%) believe that the augmented reality market will surpass the virtual reality market in revenue. And that will happen in the next 3-5 years.